"The 2018 tax time gift matching campaign achieved a record-breaking return on investment of 2,946% (raising almost $360,000). ... the annual revenue rose from $380,000 to $1.4 million, while PetRescue's monthly giving program grew from 298 to almost 1,500 donors." 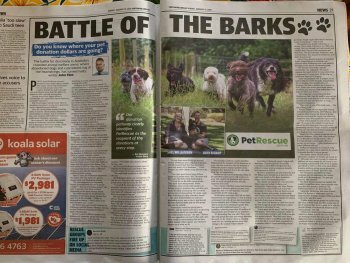 PetRescue had a massive windfall for their 2018 'Tax Time' fundraiser, with $360,000 entering their coffers. But the truly staggering thing? They achieved it using the story of a pet who wasn't adopted through their website at all. Luna was the case-study dog for the fundraiser. PetRescue paid nothing towards the care of Luna. 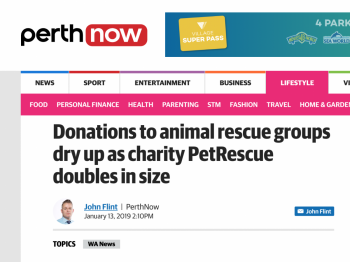 They did not consult the rescue group who cared for her to ask whether they were ok with them using her as a fundraising ambassador, with all funds being banked to PetRescue. PetRescue had never even met this dog. Yet they used her as a national fundraising centrepiece... and made hundreds of thousands of dollars for themselves. When the rescue group complained about their treatment, PetRescue doubled-down and told the rescue that PetRescue was equally important to the process of this adoption, as the rescue group was. "... Noeleen reached out to PetRescue to thank us personally for helping her find Luna. We chose to publish her lovely story because it beautifully illustrates the value that PetRescue brings to every human who needs to make their lives feel whole again...."
The rescue group rescues the pet, saves the pet, treats the pet, cares for the pet, and then rallies like crazy to find the pet a home. Sometimes PetRescue gets a whiff of involvement and then they work to turn this into a financial return for themselves. And it works. To the tune of $360,000. Dog, imagine what $360,000 could do for cash poor rescue groups. Vet bills across Australia could be significantly reduced for a start but instead they will probably be Christmas bonuses for Pet Rescue staff. No words. It's a website for gosh sakes, not a rescue. But luckily their fundraising popup will still be quietly stealing donations from the hardworking rescue groups who don't get to have holidays in December. 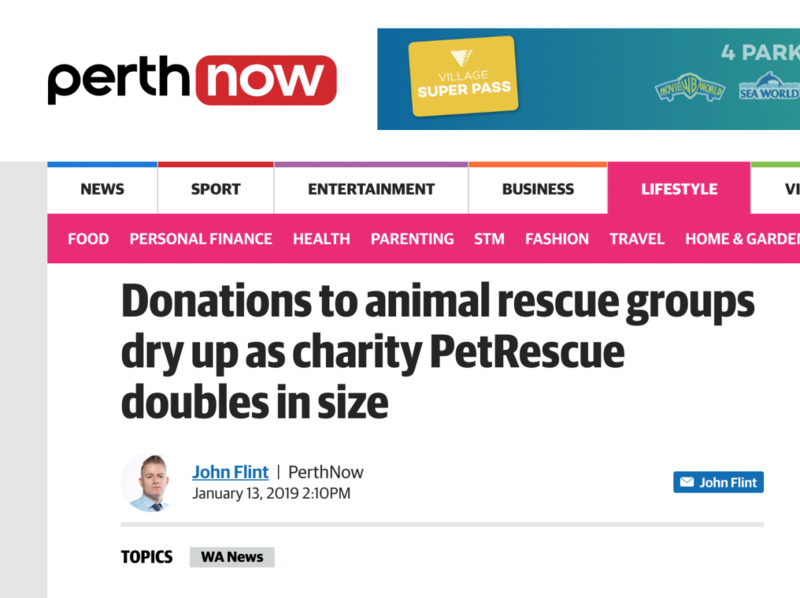 So if it doesn't go to rescue groups, where does PetRescue use those funds???? What does that money go to?? Did anyone donate to that appeal, what does it say it will go towards helping?! 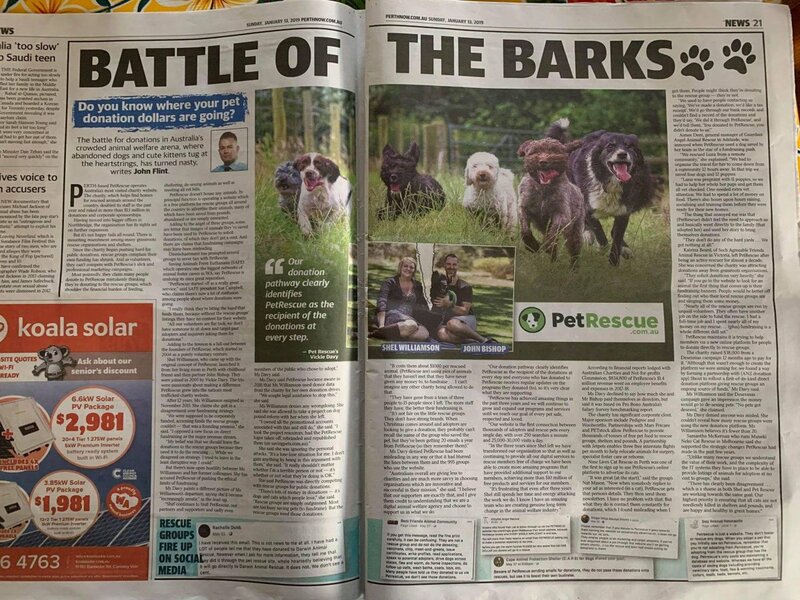 Massive, double-page spread in WA's major weekend newspaper, featuring rescue groups discussing the impact of PetRescue's predatory fundraising techniques on their sustainability. We left, not just because of the money, but because they treat their members like garbage. It's a dysfunctional relationship between members and PetRescue. I'm glad someone has finally done a decent news article. Nice to see the media spreading the word! One of the issues here is that potential adopters don’t know where else to go. I am not on Facebook and would love to see a linked list of rescue organizations website pages that don’t use Pet Rescue. We've been hinting at this for a while now, but we are super excited to finally announce the details for our upcoming February members donation campaign! This love-filled campaign kicks off on Valentine's Day, and will use the might of the PetRescue website - Australia's most visited charity website with over three million unique visitors a year - to drive donations direct to YOUR rescue organisation. Your organisation must be a registered charity, and be signed up for a PetRescue donate button via the Shout for Good donation platform, in order to be a part of this campaign. For all groups with a donate button, we will be implementing a pop-up on your pet listings. This pop-up calls on website visitors to make a donation direct to your group via the love-coloured magenta donation button on your pet listing, to help cover the costs of desexing, vet work and general care. This campaign will run from Valentine's Day, for one week, and we really hope it drives some dollars direct to your team. Find out more about signing up for your very own donation button here. If you have any queries or feedback, please don't hesitate to get in touch via [email protected]. Wonder what is running in the background to capture data from anyone who actually donates to a rescue? And how many begging emails said donors will get to send more money to PR into the future?